This entry was posted in Uncategorized and tagged Activity Patch, Camp Patch, Eagle Medal, Explorer, Flap, Insignia, Lodge, Merit Badge, Merit Badge Sash, National Jamboree, Order of the Arrow, Position Patch, Rank Patch by tucker211. Bookmark the permalink. I have tons of old boy scout stuff I would like to sell. I have some items I may be willing to sell. I metal detect and found a brass badge reading George Washington B.S.A camp Pahaquarra in New Jersey. The site is from 1927 til 1971. Also a whistle The Amce Thunder with RW Zundel’s name on it plus other things. If your interested drop me a line. I have lots of old World and national jamboree belt buckles, along with world and national jamboree patches and council strip patch collections! I am looking for a buyer! I have a plethora of scout memorabilia from badges, uniforms, handbooks, pictures, etc. that I would like to sell. There is stuff from cubs through Eagle Scout. I am located in Norfolk, VA. I am the Scoutmaster for a Troop chartered since 1923. I am looking for some vintage adult and youth uniforms for use at special anniversary events. Can you share with me what you currently have available and prices . Thank you. 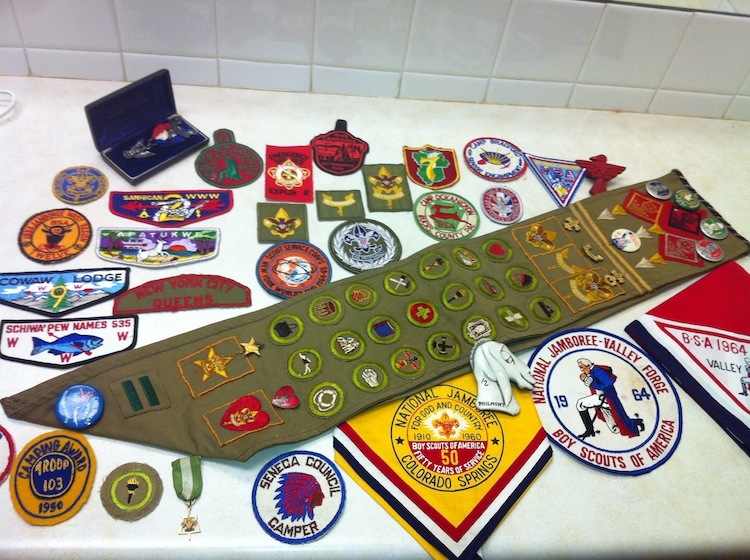 I have a complete store of old Boy Scout and Girl Scout stuff for sale from badges to camping gear store was in business 64 years. Wanting an opinion on value. From mid seventies to early eighties. Includes: Eagle Scout badge from 1981 in case with date, order of the arrow sash, merit badge sash with 33 patches, 17 merit badge books, Boy Scout handbook (eight edition), order of the arrow handbook, 2 caps, misc patches, 3 sashes, 2 t shirts, one of them eagle day with Alabama governor George Wallace. I can send pictures if interested. I have a large amout of scout mugs and neckerchiefs passed down from my grandfather. I have a 1960’s scout master hat with patches on it, I’m looking to sell. It’s in excellent condition, and I’m willingbto work with womb ever may buy it. I have a The seascout manual dated on. Inside 1901 by an apprentice.this book is in very nice condition for so old. Looking. for a buyer. Have my late father’s collection , looking to sell. Thank you, Robert.